Ed Hervey and the BC Lions saw their season come to an end last week and now the GM heads into his second year on the job without Wally Buono’s input and with a ton of questions to be answered this off-season. Who will be the new head coach? What coordinators will they bring in? What about the long list of free agents the Lions have to deal with and how will that process be affected by the pending new CBA? Will the new core include guys like Solomon Elimimian, Manny Arceneaux or Travis Lulay? Or will Hervey put his mark on this team by doing another big roster turnover? How about ownership? Will Davis Braley still be the Lions owner when the 2019 season starts? Brian and Mojo take it from start to finish this week in a season wrap up episode that discusses these issues and a lot more. Missed our last episode? Our chat with TSN’s Farhan Lalji and Podskee Wee Wee’s Josh Smith is here. They’ll have to do that without quarterback Travis Lulay, who suffered a shoulder injury on the first series of last week’s victory over Montreal. Thankfully, the defence is thriving, now leading the CFL in sacks and interceptions after the flood gates opened the last two games. Can the Lions build on this momentum? Will the offence start to get hot just like the defence has and will Jonathan Jennings take hold of the starters job again and run with it? Missed our last Episode? BC Lions beat writer and analyst Lowell Ullrich chatted with us in Episode 120. The Quarterback carousel in the CFL has slowed down to a slow spin, with most teams having their starters set in stone. In Toronto, we await word of Ricky Ray’s decision, while who will emerge as the starter in Montreal is anyone’s guess. That leaves the task of filling in a capable backup, because let’s face it, getting your starter through an 18 game season is no easy task. Without a backup who has CFL experience, you can find yourself in trouble really quick in this league. Darian Durant is out there, and at this stage of his career will probably have to accept a backup role to keep playing, but it would be shocking to see that happen in BC. 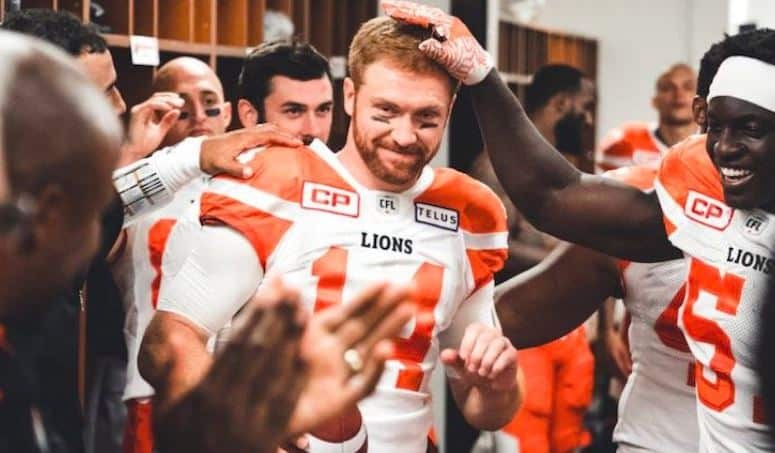 The Lions have the answer right in front of them in Travis Lulay, who showed last season he still has the skill set to not only backup but to be a starter if needed. That’s if he can get healthy of course, and if he decides he wants to keep playing. Lulay’s value to the Lions goes beyond his potential play on the field. He and Jonathan Jennings have an excellent relationship, and you won’t find a better team guy than number 14. He knows his career is winding down, and he knows his role will likely continue to evolve as a result. Behind Jennings the Lions have only Alex Ross and Mitchell Gale on the roster. No disrespect to either player, but those two names aren’t going to strike fear into any opposition defence, at least not at this point in their CFL careers. The Lions will no doubt be bringing in a couple more candidates for training camp. So the question becomes, can the BC Lions afford NOT to sign Travis Lulay? The answer in my eyes is a clear and decisive no. But while Lulay recently said his rehab is going well, he also admitted he is still having internal debates which weigh his health after football against continuing to play the game he loves. There is also the fact that Lulay has stated he wants to remain in football and possibly get into coaching at some point. With his ties to the community, the respect he has in the locker room and of course his experience, there would be no better place to start that career than with the Lions. You might recall the Lions have already seen one former player, Dave Dickenson, successfully progress in that role with division rival Calgary. But it’s his value as a mentor to Jennings that trumps all. Jennings recently agreed to a contract restructuring that is more incentive based. Coming off a sub-par year he will be motivated to rebound, and having his friend Travis around to help him do that can go a long way. It’s unlikely Lulay will be ready to compete for the starting job in training camp, but with the addition of new OC Jarious Jackson, both men can be instrumental in getting Jennings right again heading into the 2018 season. Had he not incurred a season ending injury last year, it’s quite likely Lulay would have gotten some serious interest in some markets come free agency if he got there. It’s a risk to take a chance on a player who has Lulay’s injury history, but his play last season opened a lot of eyes. Because he likely won’t be game ready until the season is underway, his value to the Lions should mean they take the risk and bring him back for at least one more season. The Lions simply must re-sign Travis Lulay, because the reward far outweighs the risk. After three straight wins and compiling an 8-3 record, the BC Lions head into their second bye week of the season. Brian and Mojo chat about the team so far and where they could be headed and hand out a few awards up to this point in the season. Freelance sports writer Cam Tucker joins the show for some expanded Lions discussion. This show was recorded on September 14th, 2016. The BC Lions have inked pending free agent quarterback Travis Lulay to a 2-year contract ahead of the start of free agency on Tuesday. The return of Lulay is big on two fronts. It gives the Lions an experienced backup quarterback to sophomore Jonathan Jennings who is pencilled in as the starter, and also provides him with a trusted mentor to continue his development. Lulay and Jennings have an outstanding relationship and the veteran received heaps of praise from Jennings last season for how supportive he was during last year’s transition. The Lions will tell you training camp will decide who their starter is, but barring a tremendous flop by Jennings, he will be the man. He transformed a struggling passing attack last year to a dynamic one, and at 23 years of age, the future is bright if he can build on that success last season. Lulay will be the security blanket, the extra set of eyes on the sideline, or that guy who can spell off Jennings for a few series if he needs to see some things for himself. Terms of the deal have not been released, but it’s generally felt that Lulay re-signed to a cap friendly number with the Leos who also may have discussed a future coaching role with the 2011 CFL MOP, following a similar path that has seen Dave Dickenson become the head coach of the Calgary Stampeders. The signing was valuable for not only the Lions, but the community as well, where Lulay is a tireless ambassador for the Lions.